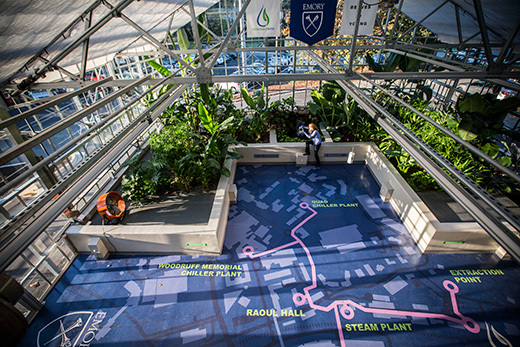 Emory’s WaterHub, which uses processes that emulate natural ecological systems to reclaim wastewater, was honored with the 2018 Campus Sustainability Achievement Award. It recently reached the milestone of recycling 200 million gallons of water. Emory University has received a 2018 Campus Sustainability Achievement Award from the Association for the Advancement of Sustainability in Higher Education (AASHE). The university was recognized for its innovative teaching and student docent programs related to the WaterHub, which uses engineered processes that emulate natural ecological systems to reclaim wastewater for heating and cooling buildings and flushing toilets. The WaterHub, which recently celebrated an impressive milestone — recycling 200 million gallons of water — serves as a living laboratory and a platform for hands-on research. “Emory is honored to be recognized with AASHE’s 2018 Sustainability Achievement Award,” says Ciannat Howett, director of sustainability at Emory. “AASHE is the premier organization for sustainability in higher education, and this award reflects Emory’s national leadership in sustainability innovation, resource conservation and resilience planning. “Every member of our Emory community should feel proud that they are playing a part in our university making a difference in public health, social justice and environmental protection,” Howett says. Launched in 2015, the WaterHub utilizes an ecological treatment process to clean wastewater for non-potable uses on campus and was the first system of its kind in the U.S. Developed in partnership with Sustainable Water, the facility provides a low-energy, high-efficiency cleaning process through filtration, circulation through natural earth and plant bioreactors, and exposure to ultraviolet light and chlorination. The system can recycle up to 400,000 gallons-per-day — nearly 40 percent of Emory’s total campus water needs. The WaterHub has received widespread international attention and more than dozen awards, most recently a 2018 International District Energy Association (IDEA) Award. The system also received a U.S. Water Prize in 2016. There have been over 4,000 tours of the WaterHub, including CEOs of major corporations, EPA’s U.S. Administrator and officials from other countries as far away as Rwanda, and Scout and school groups. Student tour guides help engage visitors and offer insight into the facility’s innovative technologies and environmental and educational purposes, as well as offer ways individuals can be water stewards in their own lives. Tours are currently offered on Tuesdays and Fridays. View the schedule to register for a tour.